Thank you for your interest in our family farm and restaurant. We are now hiring for Server, Host, Cashier, Dishwasher, Cleaning Person, Cook, Performers, Singers, Baker, Tour Guide, Artist/Painter, and Educator. 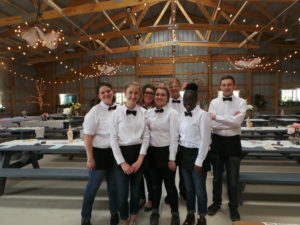 Before you proceed to the employment application, please take some time to read about Apple Holler’s mission and test yourself with some questions. Apple Holler is a family farm and restaurant. We have an orchard, a restaurant, a gift shop, a bakery, and a children’s field trip program. We’re a busy place! In order for these areas of our business to be successful, we need two things: great customers and outstanding employees. At Apple Holler, it is our goal to combine excellent service and great farm products to create a lasting, memorable experience for all of our guests. 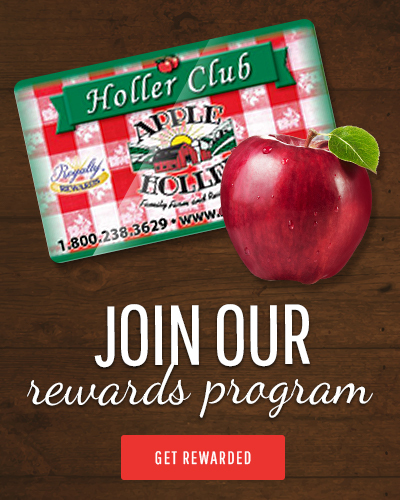 We want every guest who visits Apple Holler to leave feeling better than when they arrived. How do we do that? We use the best ingredients, offer the best products, and hire the best people. At Apple Holler, we have several significant goals. We want to earn a reputation as the best employer in the area! We will hire the most qualified people we can find. We will support our employees’ development both within and outside our company. We believe that only a happy and professional staff can give the level of personal service that we demand. We see an investment in people to be a worthy investment in the future of Apple Holler. We want to be successful! We will consistently deliver our service guarantee that every guest will leave Apple Holler feeling better than when they arrived. We will provide outstanding service – the kind of unique and personal care that our guests will tell their family and friends about. We want to be good citizens of our community and our planet! We will support worthy charities with money, resources, and volunteers. We will be environmentally responsible. We will recycle, conserve water, and reduce our use of chemicals. Whenever possible, we will select suppliers who are environmentally friendly. We want to maintain a personal working relationship with our staff! We will create a trusting relationship with our staff. In this atmosphere, we can work out difficulties and make decisions together. We want to have fun! People come to Apple Holler to have a good time. We want each guest to enjoy their experience at Apple Holler so much that they can’t wait to tell their friends and family about it. We expect our employees to be friendly with customers and coworkers. This means that you stop what you’re doing and greet customers with a smile the second they walk in the door. You have to be able to make conversation with people from all walks of life and get to know people. If you’re shy or feel awkward talking to strangers, you might not like it here. We get very busy here at Apple Holler. Imagine 20 customers all needing service at the same time and you being the person to help them! Customers want to be served quickly and feel appreciated and valued, even when we are busy. You should expect a fast pace for hours on end. When you are not busy with customers, you will be expected to stock, clean, and do other prep work. But, the moment a customer appears, you will have make them your top priority immediately, even if you are behind in other duties. Do you have sales sense? Our guests will have questions – lots of them – and they will expect you to be able to answer them. Being good at your job means being knowledgeable, confident, and passionate. Everyone brings their own experience and expectations to a job, and that’s great. We need employees who can use this previous knowledge as a stepping stone and are willing to learn and do things the way that we do them at Apple Holler. We work hard and fast to serve our customers, often in small spaces, and sometimes under stress. No matter what is going on in your personal life, your co-workers are depending on you to leave your problems at the door, arrive on time, and give 110% when your shift starts. You need to be respectful, patient, pull your weight, and be willing to do what needs to be done, whether it’s cleaning the bathroom or answering the phone. Can you commit to a schedule? Whatever hours you are available, your work hours may sometimes conflict with things in your life that you’d rather be doing. We expect our employees to be available on weekends and holidays. We try to be flexible, but we rely on our employees to keep their commitments. Every job at Apple Holler involves at least some contact with the public. We serve people of all ages from all walks of life. You have to be able to give speedy service to the businesswoman and attend to the special needs of families with small children at the same time and always with a smile and a positive attitude. Are you willing to follow a grooming and dress code? We’re professionals and we like our looks to reflect that. That means that we expect our employees to arrive to work wearing clean, complete uniforms. Hair should be neat, clean, and pulled back. Jewelry and makeup should be minimal and tasteful. Often, it’s the small details that make our guests feel important. Whether it’s bringing a bag for carryout boxes, holding the door open for someone, or bringing extra napkins, we are looking for people who take the initiative to add those finishing touches without being asked. Are you often described as “fun”? You know the kind of people we mean – they’re always smiling, always see the cup as half full, and never let the public know that they’re having a bad day. That’s the kind of people we want to work with, so that’s the kind of people we want to hire. If you answered “yes” to these questions, we’d like to meet you! Please take the time to fill out an employment application. This could be the beginning of a great relationship!